Alton LaVar Wade is a retired educational administrator. He was the seventh president of Brigham Young University Hawaii and served from 1987 to 1994. He is a member of The Church of Jesus Christ of Latter-day Saints. Wade was born in 1934 in Leamington, Utah. He earned his bachelor’s degree in political science and doctorate degree in education from Brigham Young University and his master’s from California State University, Long Beach. He also pursued graduate work at the University of California, Los Angeles. He worked as a teacher at the Church College of New Zealand, where he later served as vice principal and then principal. He then became administrator for the Church schools in the Pacific Islands and later a zone administrator for the Church Educational System for over four years. 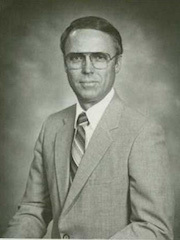 He was appointed president of Dixie College in St. George, Utah, from 1981 to 1986. From 1986 to 1994 he was president of BYU-Hawaii and during his administration he moved it from vocational education to collegiate education. From 1994 to 2000 he filled the position of vice president of Student Life at BYU. From 2000 to 2003, Wade presided over the Washington DC South mission for the Church of Jesus Christ. Wade and his wife, Diana, are the parents of eight children. This page was last edited on 31 August 2016, at 20:59.